If a competitor asked you for advice, would you give it? Probably not. Yet take this Altimeter research report on how to get more from Facebook landing pages — sharp stuff. Posted for free. Where their consulting competitors can see it and repurpose it. What gives? Sharing seems risky, especially among business warriors used to hiding secrets and skewering competitors. This morning, we had coffee with an executive from a competing ad agency to discuss forming a debate panel series, perhaps inviting other agencies from the region, and upon our return to the office met with some skepticism. What? Share ideas? Now reframe the thought from you vs. them to you in the center of a vast network. You want to reach other nodes of value, potentially future clients, but you can’t find them now. 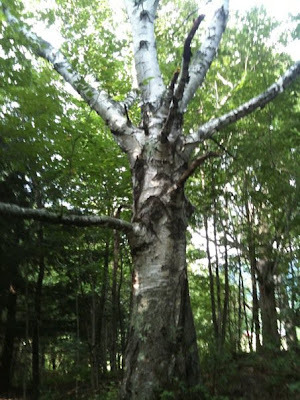 There are threads leading to them, connections through other people, and to reach them you need your message to flow along the paths inbetween. Sharing information means you’ll connect with new nodes (people, organizations) who discover you, and if your transmission has value, they will pass it along. You are increasing via randomness the odds that you will connect with value in the network. It’s akin to a single person, moving into a strange town, deciding to walk downtown to meet new people rather than sit home on the couch. The more random connections, the greater likelihood of a real relationship emerging. Sharing information didn’t matter much in business when networks were locked away behind hard corporate walls, when sales meant cold calling and door knocking. But today, you can connect with almost anyone. Things can flow anywhere. Your current client base is likely people who almost randomly found you, because they had a need and were searching in their own networks. We suggest you increase such randomness; take your next big idea and give it away. Apple’s 7-inch iPad decoy. Just in time for Christmas. This is how Apple will defend the price of its $500 iPad. We start with a Taiwanese newspaper report that Apple is building a new, smaller 7-inch iPad due in stores this Christmas. If you wonder why Apple would place yet another product between its iPods, iPod Touches, iPhones, iPads and actual computers, consider it the basic business strategy of a decoy. Do you really want the small one? Which brings us back to Apple. 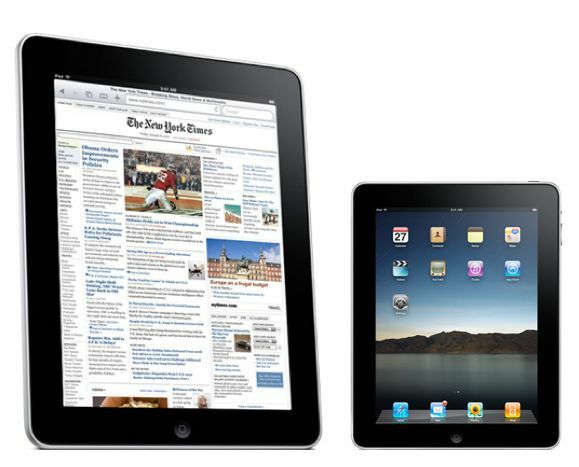 By introducing a slightly smaller, worse version of the iPad tablet, Apple kills two birds with one stone. It can sell the tiny gee-whiz gizmo to consumers who don’t have cash for a $500 toy; and thanks to a lower-end decoy, it makes the upscale tablet look better — and defends the high price. It is no secret that other manufacturers are rushing to produce tablets at lower costs, or that Apple in the past has been forced to rapidly reduce its prices to extend its toys into the mass markets. But if the decoy can help Apple defend the iPad’s high price point (we bet $400 by Christmas, with the small 7-inch logging in at $300, take that tablet market share!) for even six additional months, Apple will make millions more. So go ahead. Enjoy the new, tiny 7-inch tablet when it emerges. But if you walk into an Apple store to look at it, and then find yourself lured by the bigger, more expensive iPad, congratulations: Apple’s decoy has worked. 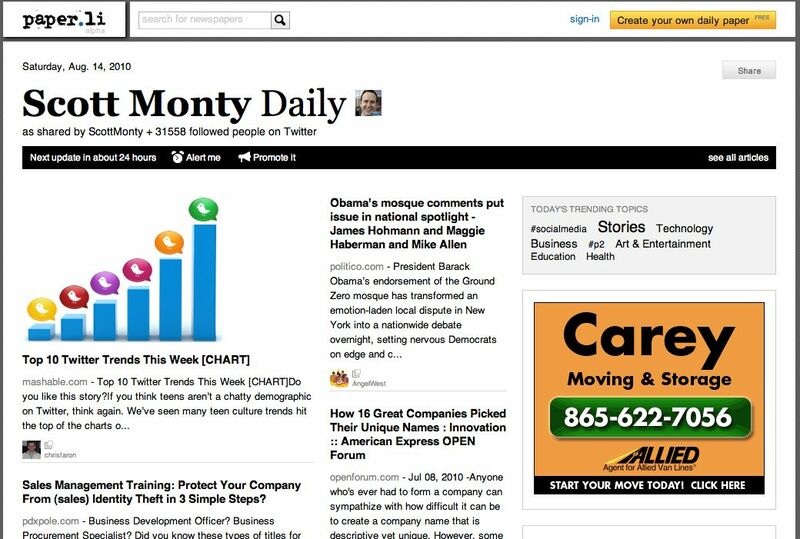 One of the great interface innovations of blogs was the top-down, most-recent-first format of a news stream. You post something, and it goes at the top of your web page, pushing older news lower. Twitter and Facebook adopted this flowing format — trouble is, as your online connections expand it gets harder to digest the torrent within the stream. Paper.li is a new web-based service that does to your Twitter stream what Flipboard can for other social media on the iPad — filter the inbound links and turn them into an elegant layout. No longer is news lost in the stream; now it pops front and center. 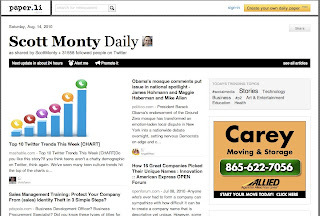 Here’s what Scott Monty’s Twitter stream looks like as a daily newspaper. Follow the logic, and you’ll see opportunity for ad targeting tailored to the context of the material your best friends think is best for you. Isn’t it nice that we’ve evolved communications to the point that the latest news looks just like newsprint? Why do advertisers use extremes? Drastic images have been around in advertising for nearly a century, so this anorexic, meth-abused-looking model for American Eagle jeans shouldn’t surprise you. Skinny and super-skinny are back in, you see, a flashback to the pencil-stick appeal of Twiggy in 1966, who thank goodness has put on some healthy curves since. If we make snap judgments based on tiny slices of information, then advertising must move fast to convey data. Extreme images bang the drum hard. 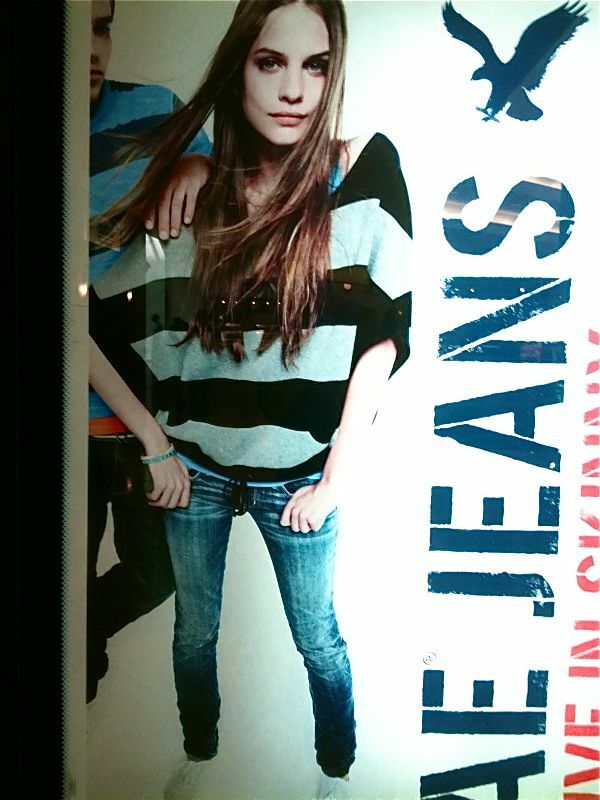 Young women may not really want to weigh 80 pounds and eat only lettuce, but seeing a model who fits that bill tosses a data point to the frontal lobe: wear these jeans, you’ll be thin. In a way, you can blame your caveman ancestors, who had to move fast on tiny pieces of information to avoid charging tigers or incoming tempests. Although we’re certain if they could see this model, they’d say, ooga, girla, you need to eat something. Clever. 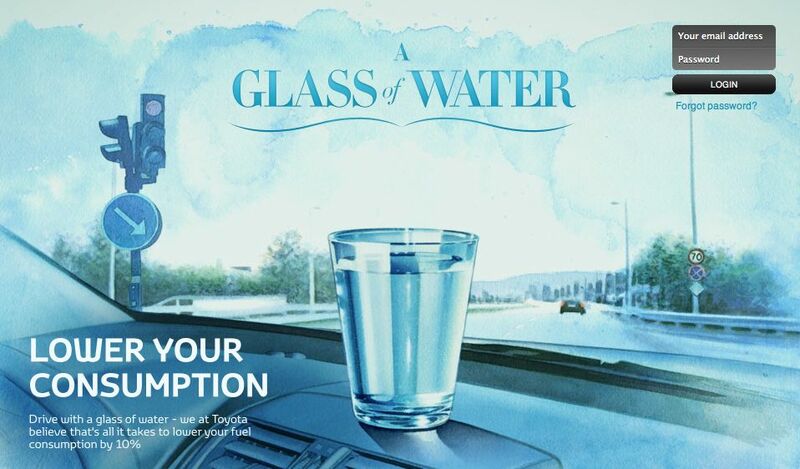 Toyota has released an iPhone app and microsite encouraging you to “drive with a glass of water,” in this case a virtual glass inside your phone that will spill water based on how aggressively you gas your car. At face value it encourages consumers to learn to drive more cautiously to save up to 10% of their fuel consumption. The app also self-identifies any consumers who are worried about efficient transportation, dare we say for future non-social-media targeting with ads for Priuses? Run the app, and Toyota now has your phone number; the company can do a reverse append to get your mailing address, and is potentially collecting data on how far and fast you drive. Next week, check your mail. What we like about this campaign is it combines the fleeting interest of social media and mobile apps — where most apps become unused after 48 hours — with a hook that tags potential customers for future remarketing elsewhere. If that sounds Orwellian, please don’t buy anything at retail stores, because they’ve been reusing your data for nearly a century. This Reebok video is making the rounds in ad circles as an example of what not to do in the viral space. You know, create an amateur video with crazy happenings, launch it on YouTube and watch the viewers scale to millions — except in this case it is blatantly professionally produced. For complete details on the mistakes made trying to show a guy stumbling across Ralph Macchio to showcase sneakers, see the post by Angela Natividad, who filed it under heavy wincing. The deeper question is, if this is a mistake, what is a brand to do? You can’t sit back and hope amateurs create something superbly authentic that will rise up the viral charts … yet if you leadenly produce something that almost looks real, but is fake, you get trashed by all of us who are wise to your manipulative moves. This may sound strange when the entire world of advertising is based on manipulating opinion, but it actually makes sense — because the problem here is the source of the information has been disguised. Humans make judgments based on where they think data is coming from; if your best friend tells you Toyotas still lead in quality, you may believe her, but if a salesperson says the same, you take it with a grain of salt. Advertising for decades has been put in boxes that are cleared marked as “source: someone trying to sell you,” so you can sit back during commercial breaks knowing there is an agenda. But hiding the source creates confusion — a level of cognitive dissonance, a failed ability to score the data with a key metric, the point of origination that tells you the motive of what is coming in. Follow this logic, and quasi-marketing-almost-authentic material ticks people off because they don’t know how to judge it. Are the shoes really being worn by a former Karate Kid movie star? Is this knowledge something true that we can use for future reference? Um, no. This is why we vote paid posts and sponsored conversations are failures of communication, because they manipulate people without being clear, and end up polluting the entire information ecosystem. Advertising works because it’s potentially useful information with the source clearly identified. Social media works because it’s helpful references from people you trust. Blend the two, and you seed confusion and potentially irritation. This is why the usually helpful blogger Chris Brogan got spanked by his followers over a paid Kmart Christmas post. So how does any marketer solve the viral puzzle? David Armano has suggested that to become remarkable, you must do something that people will remark upon. Rather than fake a creative encounter, do something truly creative with your business that others can’t help but talk about. It’s not easy building real authentic news that others will report on, but hey, that’s why they call the news new. David Armano, the great visualizer of social-media dynamics, offers a nice introductory talk on why social differs from media, and why it does more than support marketing. — Quote from Angela Natividad. Sometimes you read something that reminds you words have power, too. Finance guys are fun to watch because they bet real money on their predictions, so it’s notable that Seeking Alpha believes The New York Times Company stock is headed up due to mobile usage. Alpha suggests there are now more than 1 million people who read NYT via handsets every month, and that the scaling trend line could take NYT’s total web traffic from 28 million monthly users today to 70 million by 2015. There are implications in the logic, of course. Alpha’s calculation is based on 106 million mobile page views in June and a guess that the average mobile user reads 100 pages a month. If the real answer is 200 pages per user — say, 6 per day — 1 million mobile users is now 500,000. 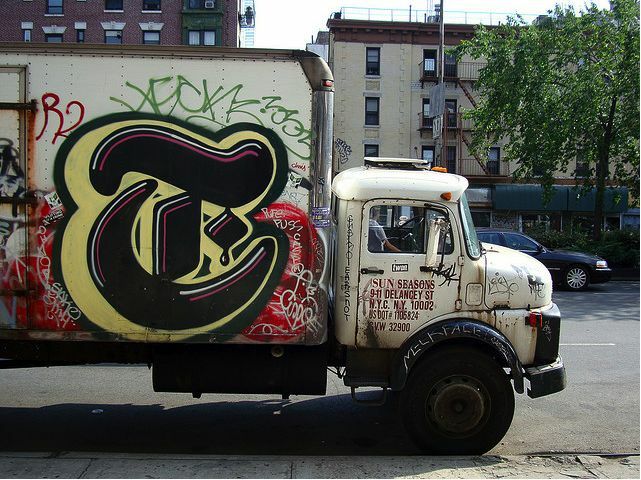 Second, the NYT mobile app has been downloaded 4.5 million times — so even if the real mobile readership is 1 million per month, that’s only 22% of app-grabbers who find the Times intriguing enough to engage via mobile. Third, the iPhone, and now the iPad, are driving bursts in experimentation by consumers who download apps … but there is always a falling usage pattern over time. Given the comical missed forecasts of mobile advertising revenues, the jury’s still out on whether mobile adoption among marquee web sites will really scale. Read the tweet above by Mullen’s creative chief Edward Boches. Beyond the words, do you get the vibe? The head of an ad agency is taking time out after a busy day of work to send an update on news he thinks is relevant. You feel connected. You may want to to contact him, especially if you’re an aspiring ad worker-bee or a client with a major budget. And that’s the goal. Boches is one of the people we’ve met in social media who is real — who works at it, spends hours a day responding to every comment on his blog, tweeting to the elite and drones alike, a human being meant to help who at the same time has attracted major new accounts for Mullen such as JetBlue, Zappos and Martha Stewart. Which brings us to the point: If you’re planning a social media presence, you have a choice. You can act like a person and engage in real time, which takes effort, or you could turn into the 2010 version of the AP newswire feed and stage news nuggets and pithy remarks using software tools such as HootSuite. (Mashable gives an entire rundown here.) Look at a screen-shot of the HootSuite interface below: can you feel the real human vibe? We don’t mean to disparage software; automating communications is a complex decision, and as email and faxes and radio playlists have proved, if it can be automated, someone will do so. But if you automate social media, you are making a critical mistake. 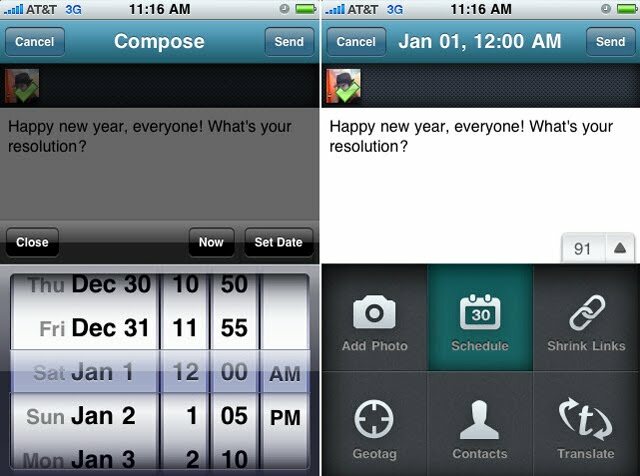 It’s midnight, a new year, and someone is asking you a question! Not. Perhaps your organization has millions of customers or fans, say, similar to Rick Sanchez of CNN; it may be extremely difficult to be real and not automate tweets or postings with help from an editorial staff and software spraybots. Yes, it’s tempting — you can fake real communications with a simple programmable click! But we’ve seen famous people who’ve reached the top, based on their own talent, hire ghostwriters, trying to extend their influence and paychecks, only to have the substandard experience crash down. It’s hard for bean counters who carry mechanical pencils to understand, but if you falsify authenticity — even if it is to reach millions of people and make boatloads of money — you’re missing the point. You can’t build human relationships on a fake platform. Social media, like any network, tends to rebel against malicious intrusions (see telemarketing and the DNC list). The reality is social media is scalable, but only to a certain level. To reach it, you have to work hard, and then maintain those relationships every day. Fake your connection, and the people on the other end will eventually tune out. Inspired by Stuart Foster of The Lost Jacket.